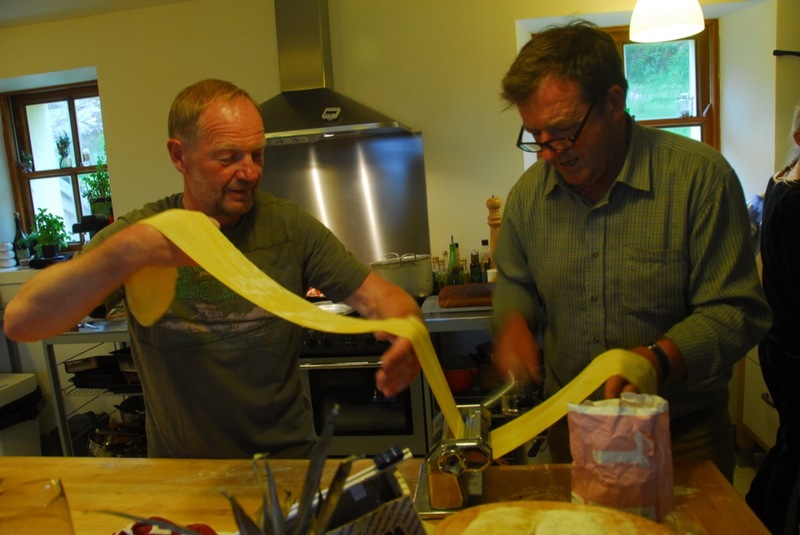 A number of years ago we began to try to use more and more of the locally grown and sourced food. 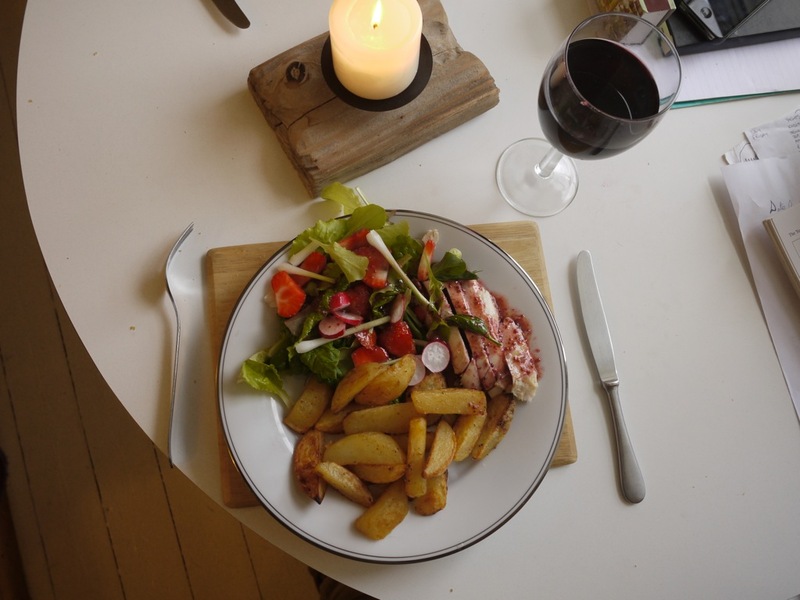 Since then our meals have been getting more interesting and instead of planning the meal we usually see what is available and in season, then put it together. Often with interesting and surprising results. Here are a few morsels of what we do. We often take food photos because there is nothing worse than trying to remember what it was that we ate in a restaurant weeks ago when we try to make it. With the help of the ‘Morito’ cook book, we put the Ceviche together and it was just the best thing. We had had it made for us many times by our Danish friends but this was a first and so quick and easy. With nothing else to accompany it it was such a refreshing starter. I had gone to get some onions for some smoked haddock we got from Portree Saturday morning and found that the big bag of shallots we got from Skye Wholesale was on the way out. I had seen the recipe for roast/ caramalised shallots the day before so it was very handy to get it out and salvage what we could. Brought tears to my eyes dumping half a bag in more ways than one this morning!! With a wee bit brown sugar, some red wine vinegar topped up with Madeira (I had no sherry, somebody drank it!! 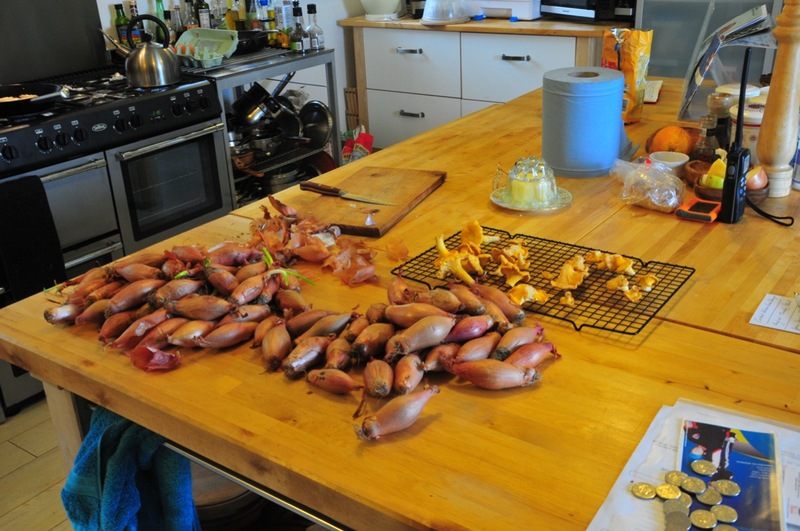 ), we had a store of lovely tasting shallots plus the aroma! My ‘wee’ sister stumbled onto a new mushroomy place and came home with a bounty, lets hope we get them for a long time this season. It is shaping up for a good year for them and so tasty. Some good recipes on the internet we have never tried so watch this space. With all the summer things going on there is not a lot of time for food blogs and I’m trying to catch up on what is happening in that world elsewhere. 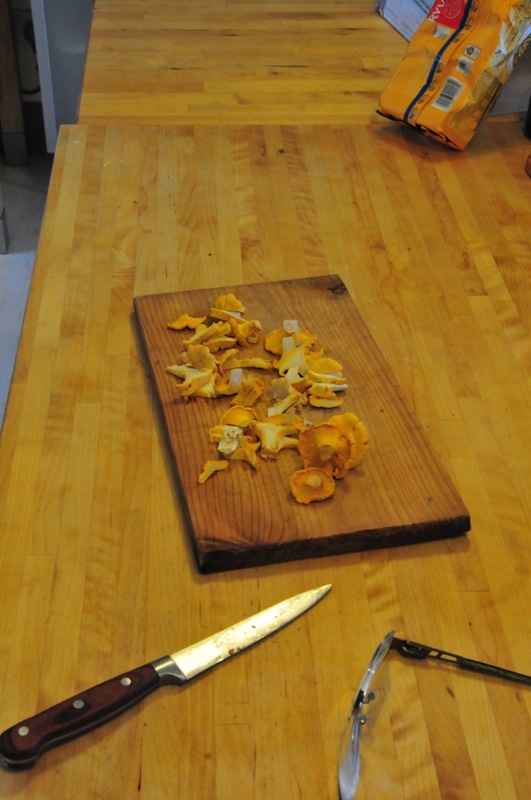 Of course it is that time of year with lots of produce and we had our very first Chanterelles the other day, delicious they were too, simply sauteed in butter and garlic then on toast. 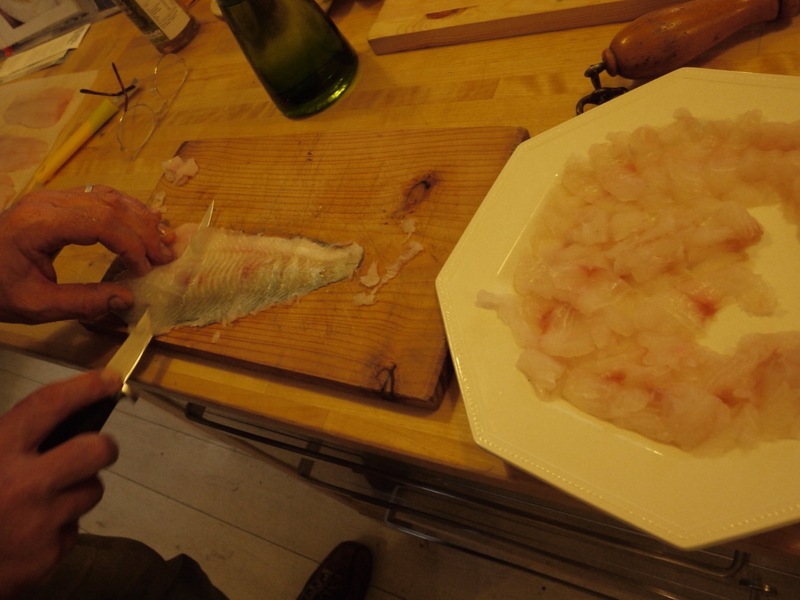 The Pollock we caught is in the freezer and we will make a Ceviche tomorrow plus Friday Fish and Chips. The kitchen is going like a fair and not enough time even for photo’s. 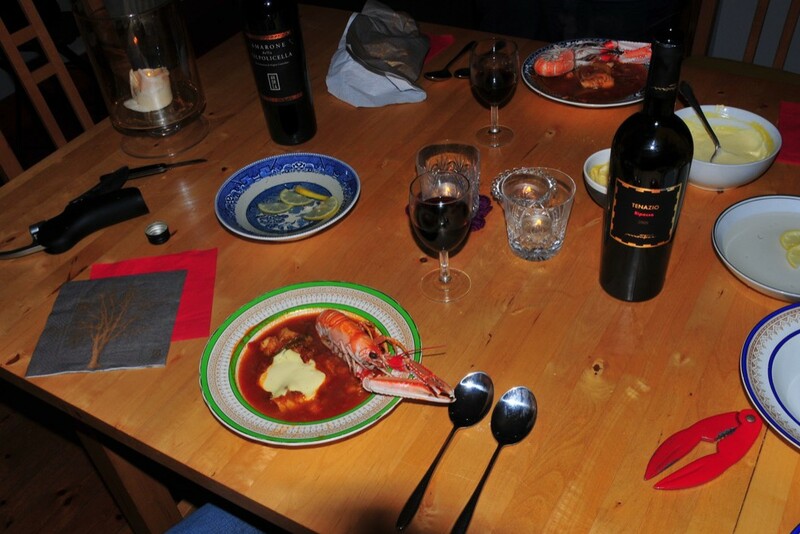 The highlight of this week, Bouillabaisse, Rona Style. We have lots of shellfish for stock so it is a regular on the menu but we do not get fennel much, this time we had both fennel and orange, what a difference!!! Can’t wait to try it again. Last night it was Rona hogget, long slow roast then served up pulled apart on a platter, excellent. Such a shame we cannot butcher our own sheep for sale on the Island, that would be really tasty for our visitors. To go with it ‘Jansson’s Temptation’. Possibly not good for the figure but very good to eat!! 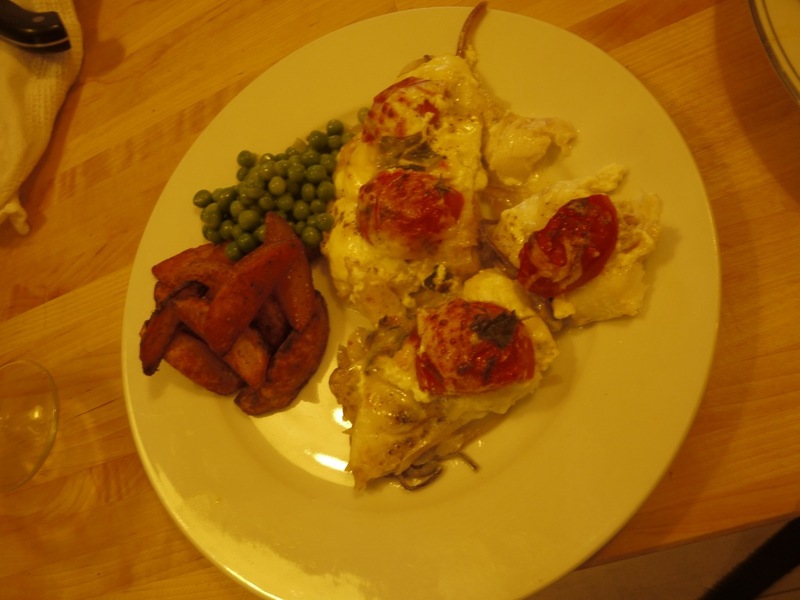 Yacht Escapade was the venue for a cracking dish of ‘Baked Cod and Creme Fraiche’. You can use any fillets and like us make it up as you go along (as we did last night), we call it ‘Pollock Escapade’ instead of Escabeche!! We did not have Creme Fraiche so used Soured Cream and Greek Yoghurt mixed. 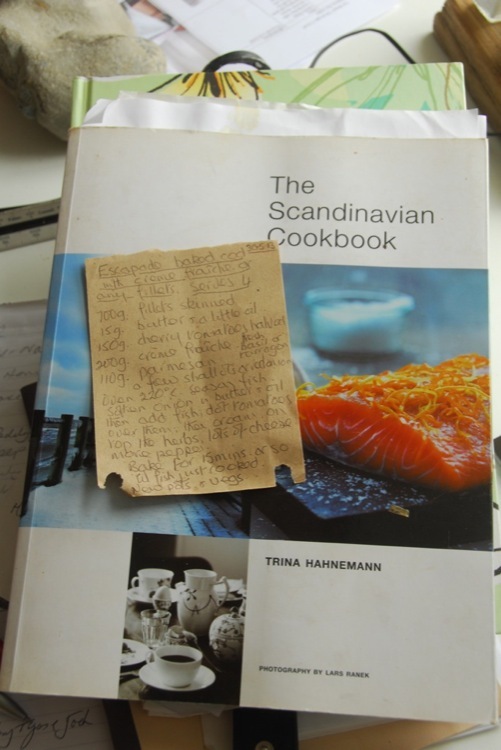 The book it rests on is excellent, very good for Rona as the ingredients are easy to find around the Island. However, the dish is so simple and tastes fabulous, nice with some Prosecco (and violet syrup we got last year in Provence, lasting well). Can’t get away from Irene’s chips either, third night with them, we are not bored. Chip potatoes, par boil them, put them into a plastic bag with a couple of tbsp’s olive oil, we put paprika/salt and peper too, just a pinch (or to taste), shake them about to get covered in the mix, empty them onto a tray and place in a 220 degree oven for 30 mins. 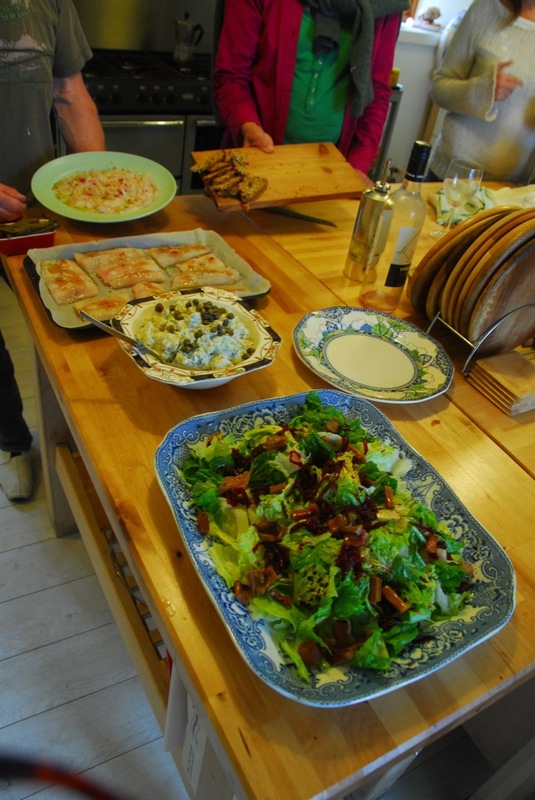 Yes we had them with Chicken, dressed with strawberry dressing + strawberry salad all from the polytunnel (the veg at least). 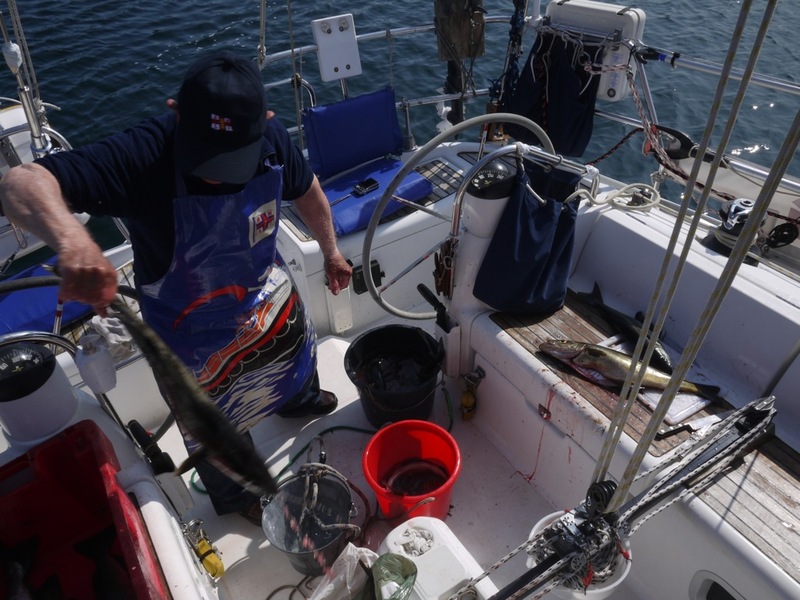 On the 13th June we had our last meal on Rona with our Danish visitors, as much as we tried to catch Pollock we couldn’t , but thanks to David Banks we had some in the freezer. 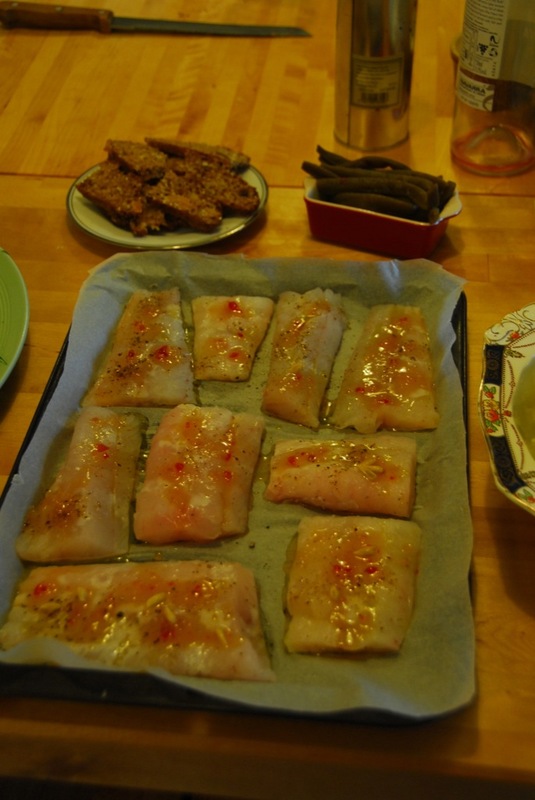 So as it was from frozen Dorte made a Ceviche, Arne a baked Pollock with sweet Chilli sauce, I took the photos! The bread was the oatmeal loaf, but with fruit in the mix (and some more nuts). Off to Edinburgh where we stayed in The Howard Hotel, in the evening we had booked a table at the Kyloe Restaurant in the Rutland Hotel. Their main theme is well matured Scottish beef although there is plenty alternatives to choose from. 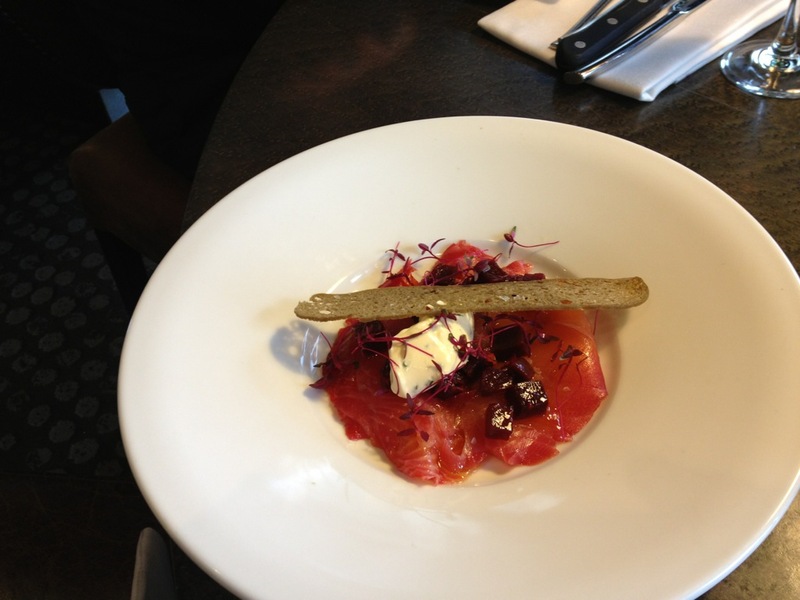 L had smoked Salmon marinaded in beetroot, which we have a recipe for and must try it. 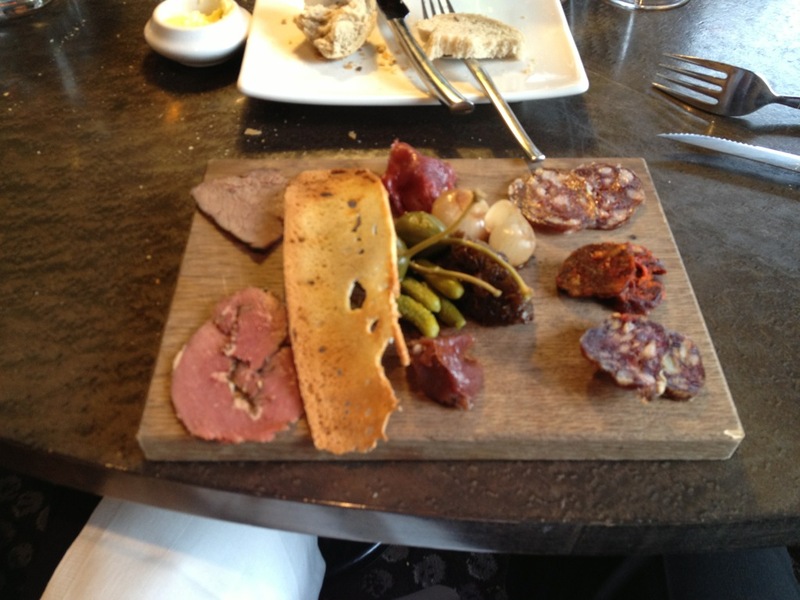 I had meat, the starter of six meats was excellent, the main a selection of cuts and it has to be one of the best meals out this year, thoroughly recommend it. The meals get better and better!! We almost always make stock with a chicken now on Rona after our visit to the cookery school in France. we find that we get much more from it and this week Arne brought 3, so lots of stock. The best bit is it spreads out the meals from the 1 chicken. Once the stock is made soup is the easiest and usually we have chicken noodle with a Thai twist but this week Arne, Dorte and Johanna have been very creative. 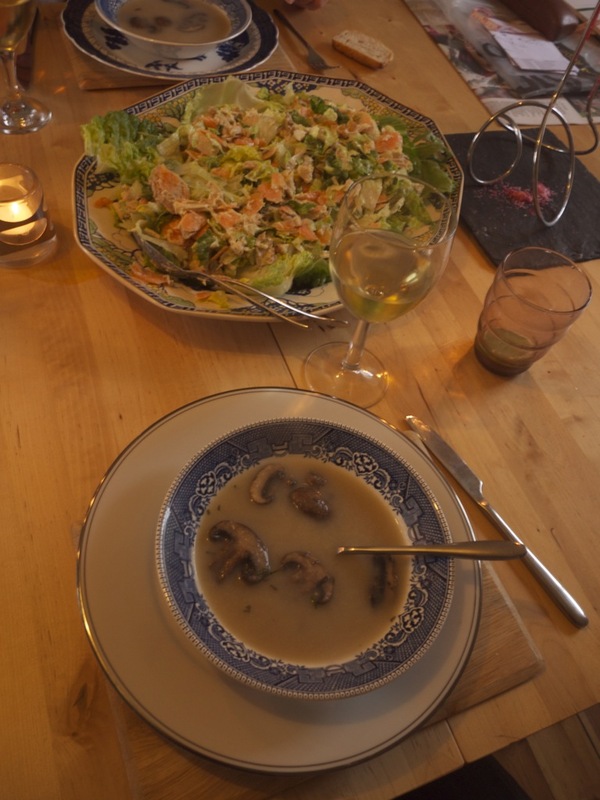 Hows about stock, a shallot, garlic clove sauteed and a very small cauliflower plus fried mushrooms on top. Fry the garlic clove and shallot, add the stock boil up the cauliflower add seasoning but with stock it is a bit deceptive so watch it, then soften the cauli’ blitz the lot with the hand blender and top with the mushroom, so simple. The chicken salad was straight forward but with a lovely dressing of Greek yoghurt, some horseradish sauce and mustard, one spoonfull of each and some olive oil. That was Tuesday. (and getting fatter). 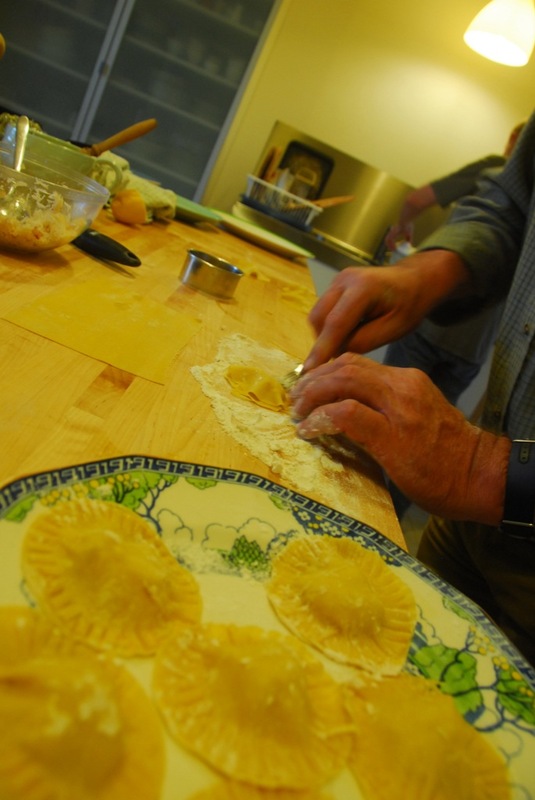 We caught some langoustines and crab on Tuesday afternoon so we thought about Ravioli on Wednesday, a lot of work but well worth it in the end. 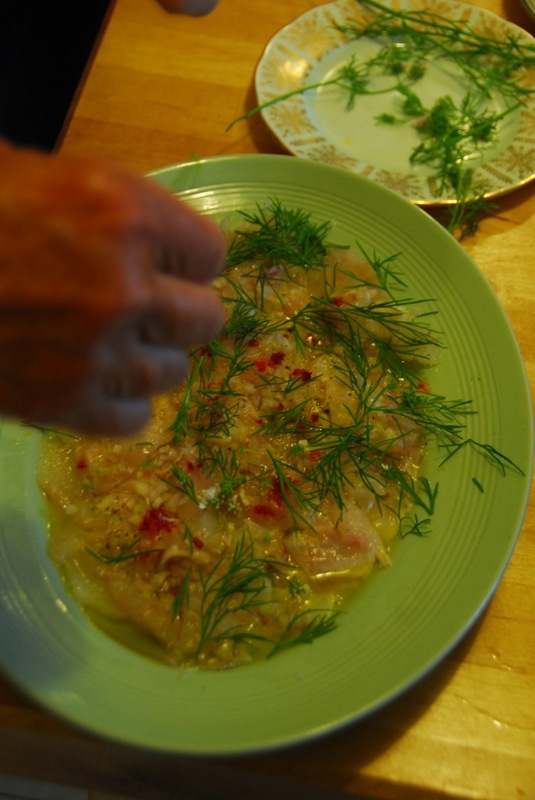 Arne used the crab claw meat and dressed it with lime only for the filling. Simple nothing fancy no cream. 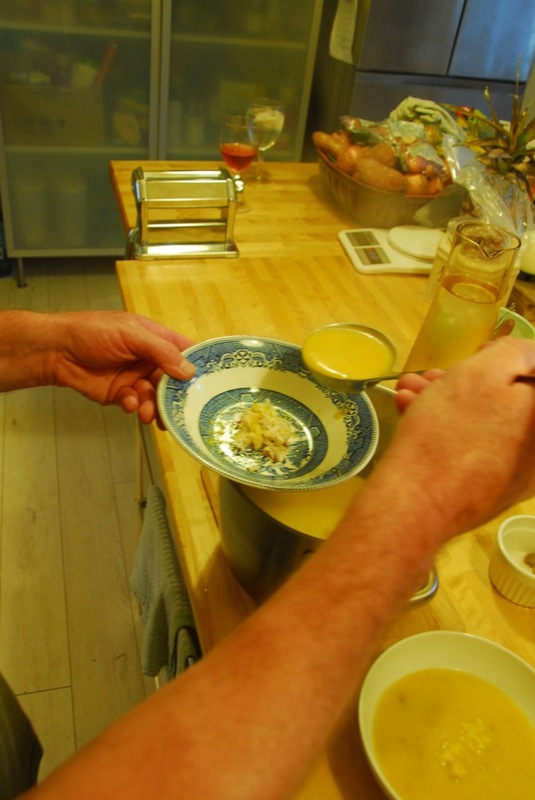 We had quite a bit of crab meat left so Arne thought about using it in the centre of the soup, he had used some more chicken stock, diced some parsnip and boiled it up, once it was soft he added a table spoon of lime pickle and blitz it up, there may have been coconut milk but he is not here so I cannot ask him. Maybe later. Anyway it certainly worked, delicious. 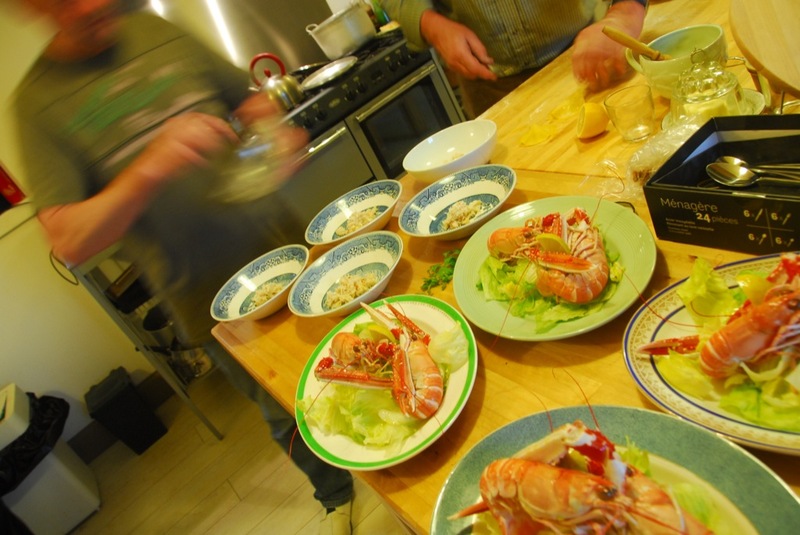 The langoustines were, as usual very tasty and simply put together, boiled in salted water on a bed of salad with some bread. 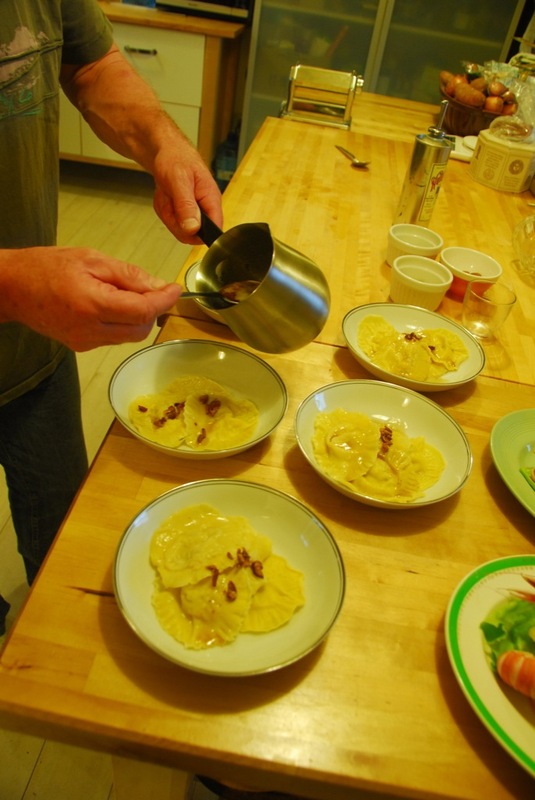 The Ravioli finished the main boiled up for a few minutes and dressed with some ‘burnt’ butter (clarified butter ) with chopped almonds. That’s all. 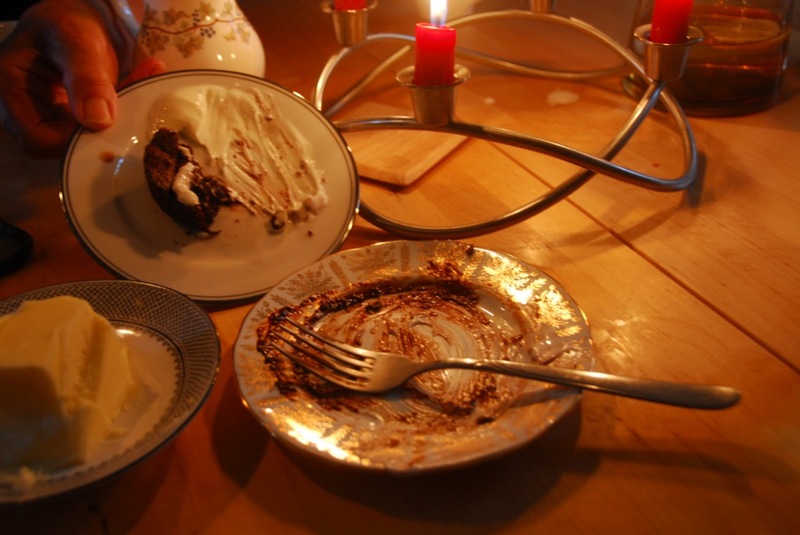 Johanna had made a beetroot and chocolate brownie cake from the Scandinavian cookbook, finished of with some Greek yoghurt. I just ate it all, we did help with the washing up though. The wine was a Pinoit Grigio and a Rose. Tuesday 11th June: Dorte, Arne and Johanna are here from Denmark for a week. It is great to have them and as usual the Rona kitchen becomes a Scandinavian kitchen overnight. Last night we caught some crabs and just boiled them up, made a dressing and salad then cracked crabs around the table. A bit messy but great fun. 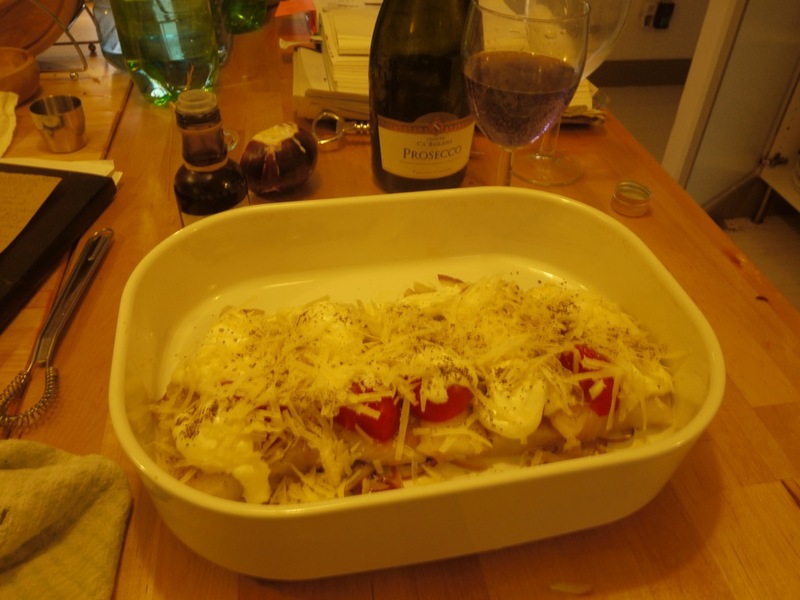 The talk amidst a bottle or two of wine turned to a food blog page, so here we go. Something positive to focus on for the summer. No photos from last night but there will be some soon plus recipes. The Danish party arrived in glorious sunshine with lunch ready to be served. Fish cakes on Stornoway black pudding with a crostini topped with squatties in a mayonnaise sauce. 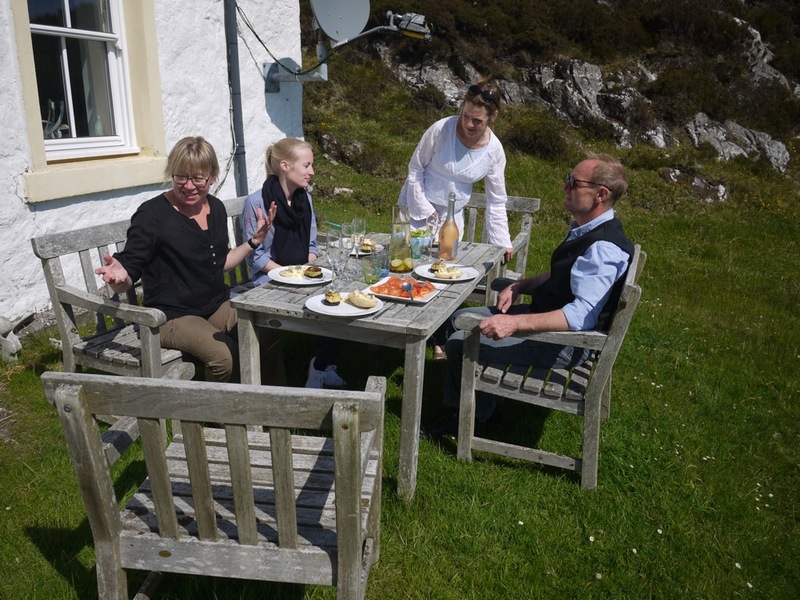 David and Muriel Banks had gone fishing the day before to the East side of Skye and returned with a box of fish for us, I filleted them and the ‘bits’ were turned into fish cakes. 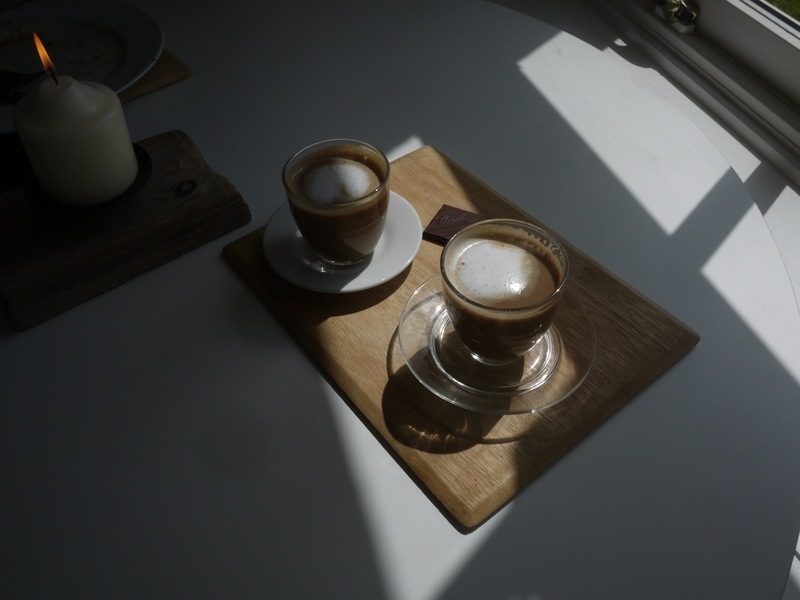 The only other thing we had been experimenting with were Cortados! On discovering them with Kenny Shieldaig on holiday they are now our favourite away from home. Once we managed to find the glasses on ebay we got to making them, we’ll get to the foamy bit yet.